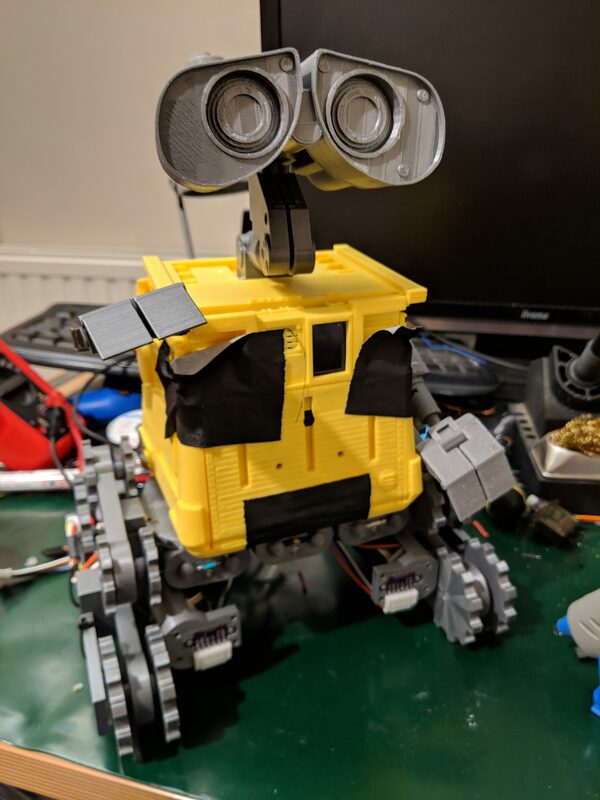 Lance just finished printing Wall-e’s head and arms and I couldn’t resist a little portrait. His tracks are out for a refit; attaching grippy TPU treads onto the slippery PLA. we can build the code on our fast laptops and only deploy the built code to the robot’s Pi. The deployed container works just the same on my Pi and on Shaun’s Pi. We can package our build toolchain so that that too “just works” on my laptop and Shaun’s laptop. 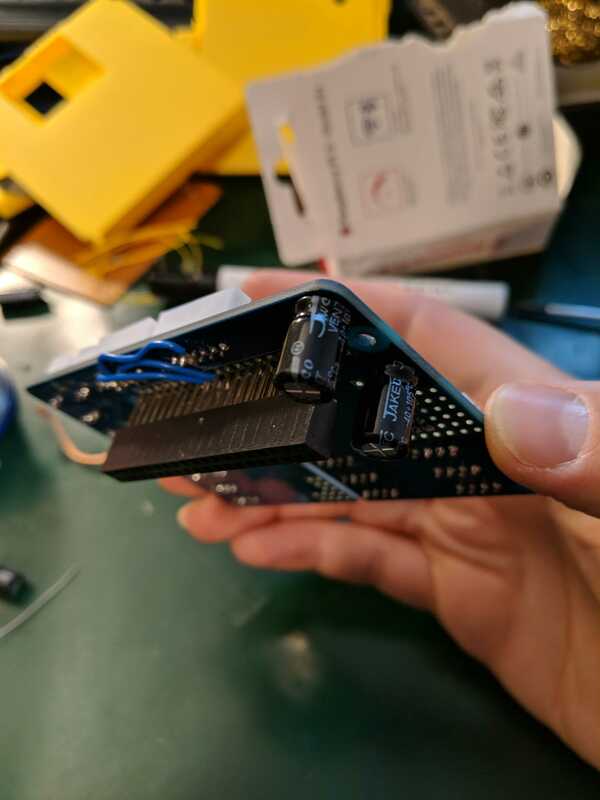 If we have to rebuild an SD card on the day, it should be easy. 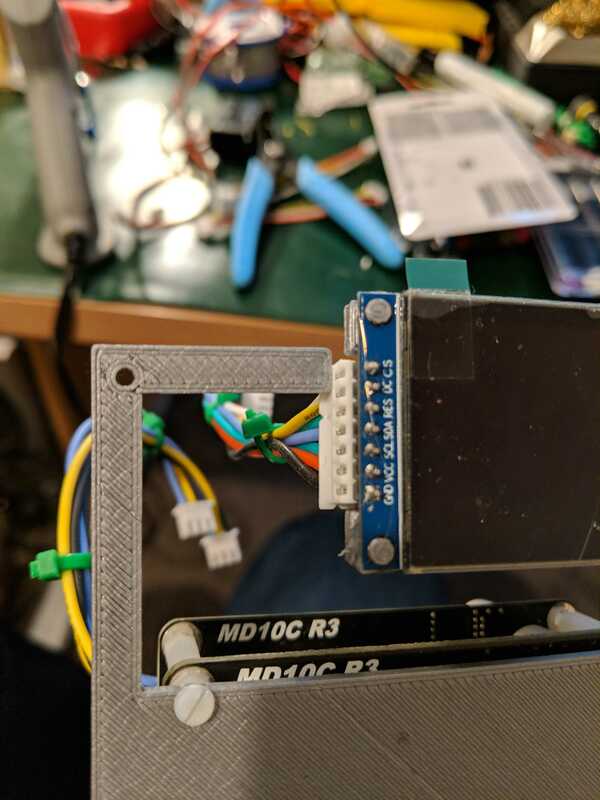 We don’t have to install OpenCV ourselves (someone else has already done the hard bit for us)! # and do the builds in there. # stops expensive gocv builds when we're compiling the controller. # Add the propeller IDE tools so we can extract the propman tool. 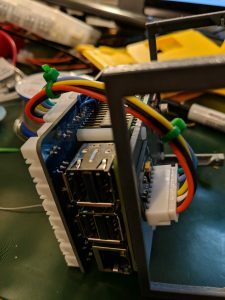 start with the docker container by the sgtwilko organisation called rpi-raspbian-opencv with the version stretch-latest (this gets us the latest version of raspbian with opencv pre-installed). Run apt-get to install compilation tools. 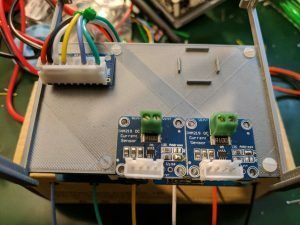 Set the working directory to be where the go-controller code is mounted in. A note about layers and caching: docker containers build in layers – docker caches container images at each command in the build. If you rebuild a container, it will start from the latest container image that hasn’t changed. So it pays to put the stuff that you won’t change early in the Dockerfile (like our build of OpenCV). # directory so that they're easy to find in the next phase. Grab the build container contents. This says – if we’re building on an x86_64 machine (i.e. our 64 bit intel laptops), then put that magic string into /proc/sys/fs/binfmt_misc/register which registers the qemu-arm-static binary as an ARM interpreter in the kernel (using binfmt_misc kernel module). In other words, use the qemu emulator to make this machine pretend to be ARM architecture while building. The other way is to docker push <imagename> the image to Dockerhub – this is cloud storage for Docker images. 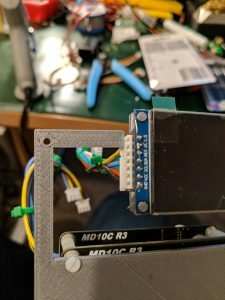 We can grab that from the cloud on the Pi with docker pull <imagename> allowing us to grab and run the docker image on ANY Pi (connected to a network and running the Docker daemon) – so I can easily grab and try out code that Shaun has built and pushed to Dockerhub on my Pi at my home. This setup is a reasonably advanced use of Docker and pretty similar to what we have in our day jobs (building an open source software project for deployment on different architectures). Once again this year, we’ll be making use of docker on the robot. Docker is a linux container system. I’ll explain how we use Docker in the next post, this post will concentrate on introducing Docker. Containers are a way of segregating processes. A docker container has its own filesystem, separate from the hosts (though you can mount part of the hosts filesystem into the container if you want to). Processes running inside the container cannot see processes running outside the container (either on the host or in other containers). If you use an appropriate network plugin, it is possible to set up networking for the container too (e.g. so that you can run a web application on port 80 in multiple containers on the same host). The only thing that gets shared between the host and the containers is the host hardware and the linux kernel. One way of looking at Docker (if you’re used to python) is that its virtualenv on steroids. Virtualenv gives you a local python environment that you can install libraries into without affecting the systemwide python environment (and potentially breaking other packages). A docker container gives you a whole filesystem to do stuff in that’s independent of all the other containers and the host. An example of this: if you have code built to run on Centos, you can install it (and all its dependencies) in a container with Centos and it’ll just work on a Raspbian host. Or code which worked on an old version of Raspbian, but doesn’t work on the latest. It makes your code totally independent of what’s on the host, so long as the host is running the Docker daemon. 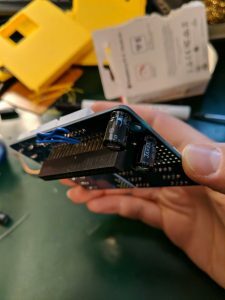 So I no longer need to be careful about how I setup my SD cards for my robot – so long as they have Docker, the container will run just the same – which makes collaborating on different Pis much easier. You never run into problems where “well it worked on my machine”. Posted on 11th March 2019 10th March 2019 Author lwr20Categories ProjectsTags PiWarsLeave a comment on Docker part 1 – what is it? Wall-e wouldn’t be Wall-e without his screen; it’s a critical part of his character! 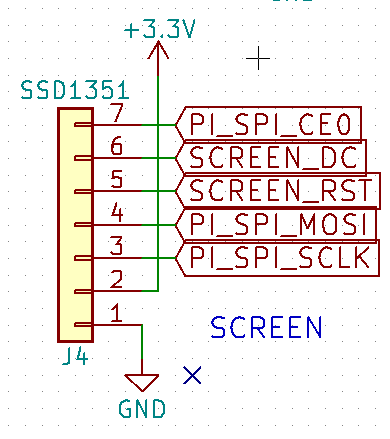 We’ve had the screen working with test programs over SPI for a while but one of our voltage sensors was a dud. That meant we hadn’t been able to get the iconic “CHARGE LEVEL” screen working in full. Today I swapped out the voltage sensor and added a screen update loop to the code. Then all of a sudden there’s Wall-e! He feels real now! 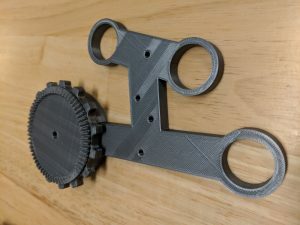 The usual solution to this problem is a thrust bearing – normal bearings are good for taking load in a radial direction (like supporting the weight of the robot through an axle). A Thrust Bearing is good for loads along the axle. This years robot is a milestone for us in terms of the amount of 3D printing that has gone into it. It started last year with the discovery that you could design really complicated things (that worked!) when we made custom mecanum wheels. So this year we designed tracks, brackets, nerf dart shooter and even thrust bearings! And all of this has been done in Onshape. Onshape is a web based parametric CAD package. 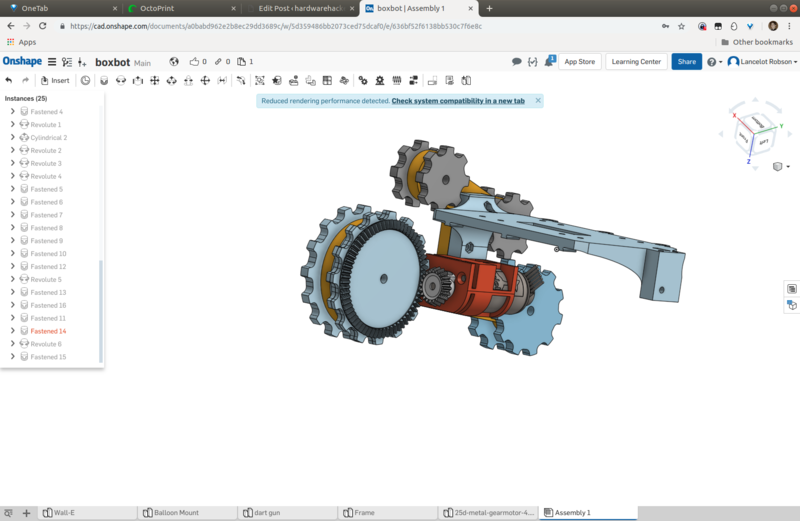 It seems that the hobbyist community mostly uses Fusion 360, but for us that was a non-starter because it is Windows only, and I no longer have *any* Windows machines. 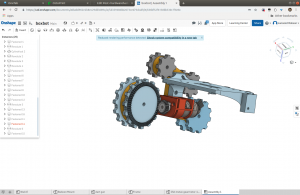 Onshape works completely in your web browser and stores its data in the cloud, so I can drop into it for a quick design session from work or at home without having to install anything. And with their android app, also while commuting on the train. They have a plugin system too for people to write custom tools when the existing ones are insufficient. 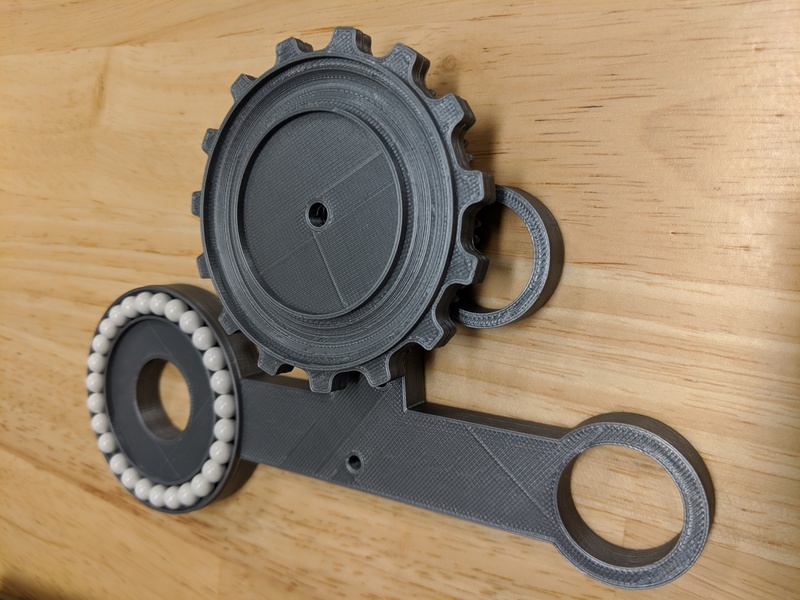 This year we used Nut Pocket (which generates pockets for nuts, so that you can use standard fasteners in your 3D prints) and Bevel Gear Generator (which generated our main drive gears). Since we’re using unprotected LiPo batteries, which would be seriously explosively damaged by over-discharge, we’ve worked some I2C voltage and power monitors into our bot this year. 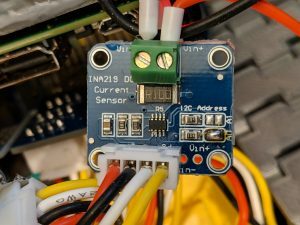 We’re using these INA219 boards in-line with the battery cables to measure voltage, current and power. 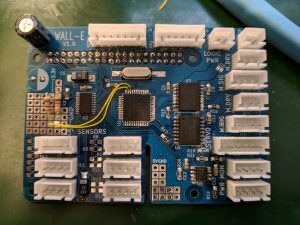 Out of the box, the sensors can read the bus voltage (i.e. potential difference between ground and the IN- connection). To get them to read current and power, you need to set a configuration value in one of the registers. One gotcha we hit was that the bus voltage register is not “right aligned”, some of the low-order bits are used for status flags so you have to take the voltage reading and shift the value 3 bits to the right to extract the voltage and then multiple by 4mV to scale it. Since we had some strange power-related gremlins last year, we split the motor and Pi power so that the motors are powered by a completely separate battery pack. That means that we have two INA219s; one for each pack. 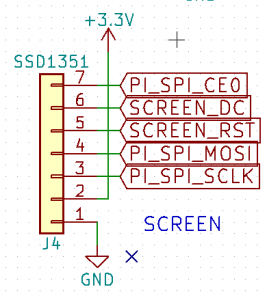 ￼Fixed missing pull up resistors on one of the I2C lines. We got lucky and this cable was exactly the right length! All the others needed work though. ￼￼Lower profile capacitors so that it actually fits in the case! Posted on 24th February 2019 25th February 2019 Author lwr20Categories ProjectsTags PiWarsLeave a comment on Assembly! Wall-e wouldn’t be complete without a screen. 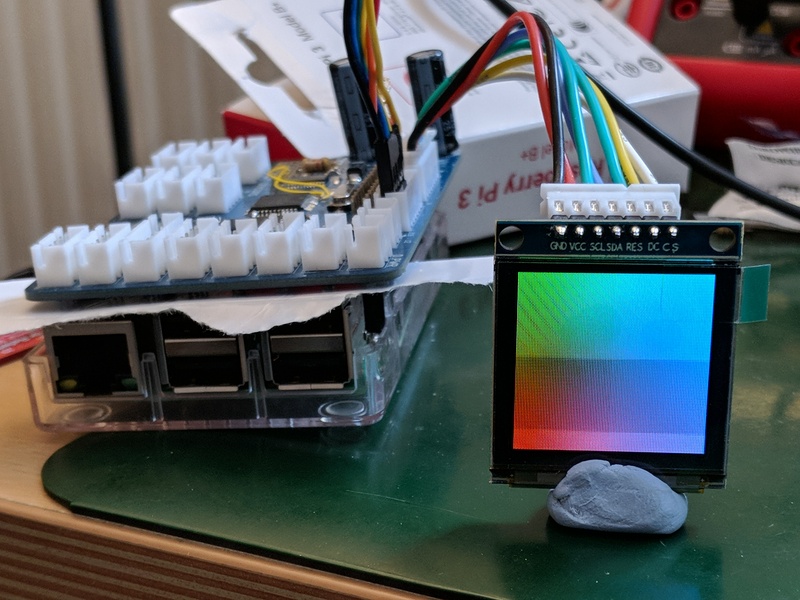 We’re using this 128×128 colour OLED screen that works with the PiOLED kernel driver. 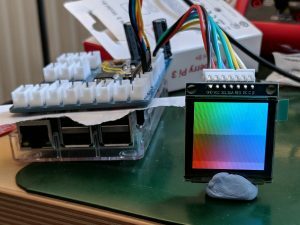 we were able to get it working with the fbtft driver, which exposes the screen as a standard framebuffer device. I hadn’t worked with the framebuffer before but it turned out to be fairly simple to use. Basically, it exposes the screen as a special type of file; if you open that file and write a couple of bytes to it, it updates a pixel on the screen and then moves the cursor to the next pixel. Once you’ve written 128 pixels, it moves to the next line. You can use the seek operation to move the cursor to a different place in the file, which is the same as moving the cursor to a different place on screen. Calculate your red, green and blue intensity. Scale green to 0-63 (i.e. 6 bits). Write those two bytes to the address of the pixel; first the gggbbbbb and then the rrrrrggg byte. Since we’re writing our code in golang, I searched around for a golang drawing library and found the gg library. // Open the frame buffer. // Loop, simulating a change to battery charge every half second. // Move the current origin over to the right. // Draw the larger power bar at the bottom. 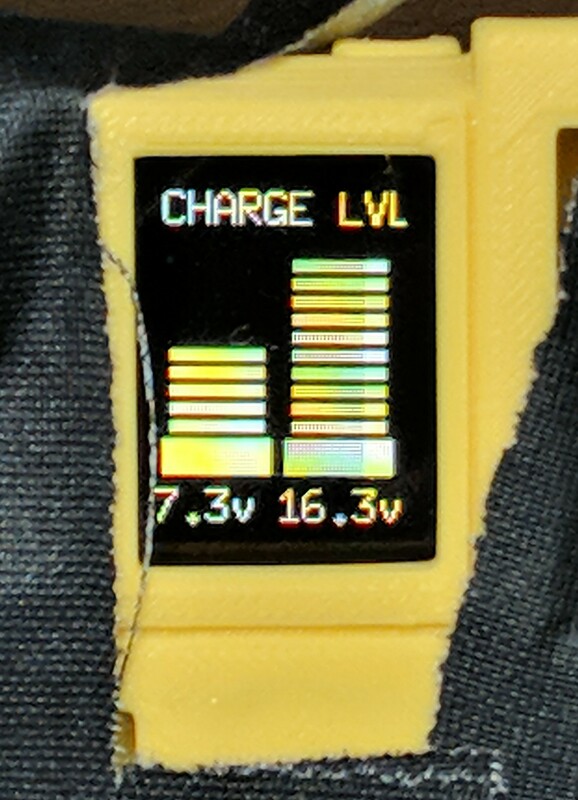 Colour depends on charge level. // Copy the colours over to the frame buffer.